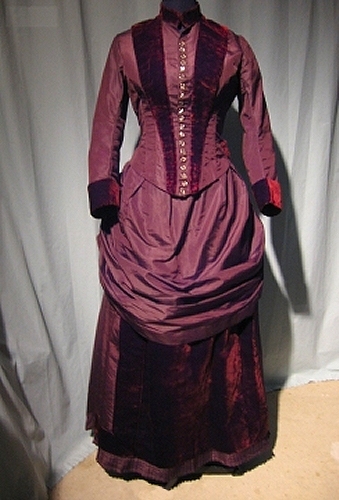 A bustle dress (bodice and skirt) circa 1880s. Private collection. I am not a vintage collector, but sometimes a vintage garment I’ve encountered lingers in my mind. I photographed this bustle dress, probably from the 1880s, purely for the purpose of inventorying a large collection, but it’s one of those outfits I continue to puzzle over. The big question for me is: why does it still exist in such “barely-worn” condition? After 140 years, it had no shattered silk, not even in the folds of the bustle. It did not show signs of alteration, or fading, or cannibalization — and there was a lot of good fabric in its skirt. 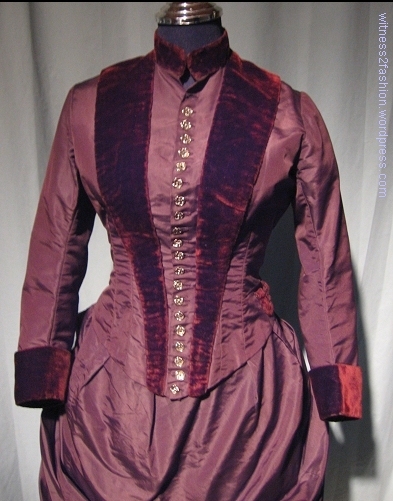 It would have been easy to update this bodice with 1890s sleeves and a shorter waistline. Or to make a child’s dress from the fabric. So . . .
Why Didn’t Its Original Owner Wear It Out? 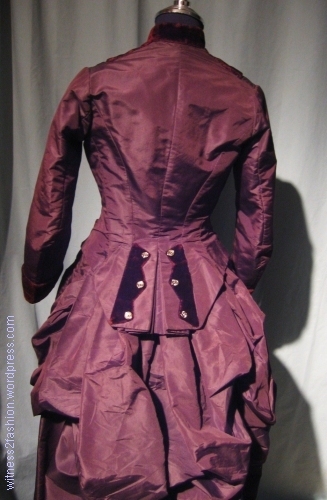 Front of bodice, 1880s bustle dress. There were slight perspiration stains in the armpits, so we know she wore it at least once. One logical explanation for its fine state of preservation could be that it went out of fashion soon after she had it made. It’s possible; I didn’t have a proper bustle support, so I had to stuff the back of the skirt with as much crumpled paper and batting as I could get my hands on. 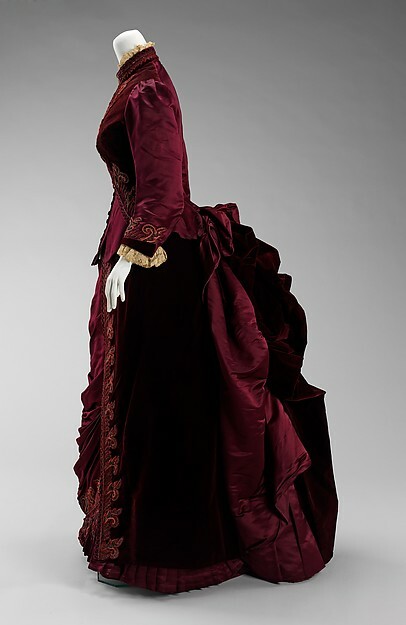 I’m pretty sure the jut of the bustle should be more nearly horizontal, like this 1885 dress by Worth, in the collection of the Metropolitan Museum. Side view of a similar gown in the collection of the Metropolitan Museum. Designed by Worth, 1885. 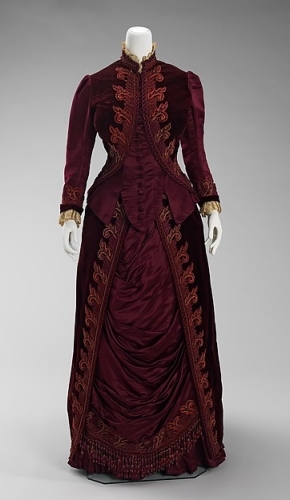 Front view of Worth dress, 1885, in Metropolitan Museum. 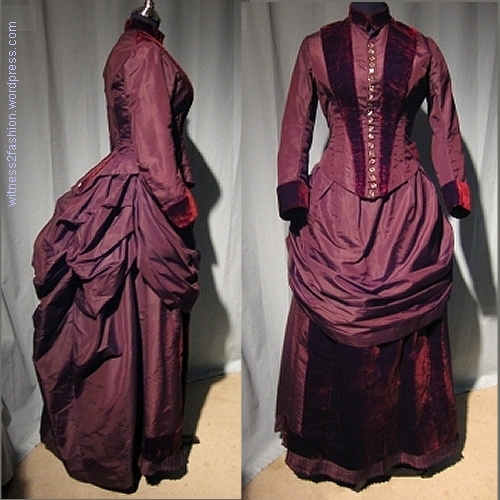 This evening costume by Worth has a buttoned basque rather like “my” dress, but it dates from 1880; its bustle is not yet extreme, at least not at the waist. 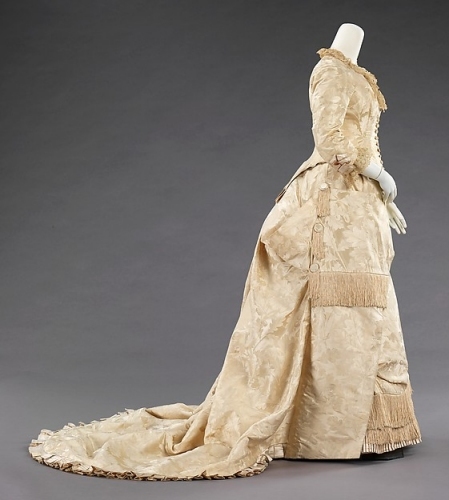 1880 gown by Worth, Collection of the Metropolitan Museum. 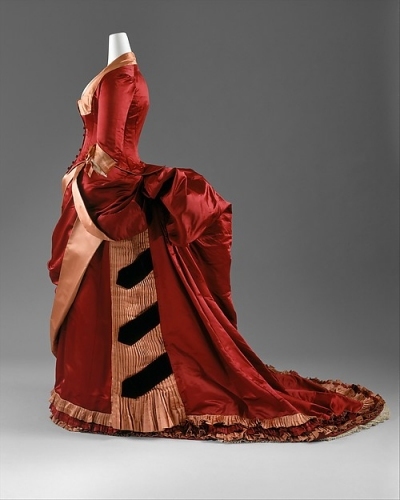 1885 extreme bustle dress, Metropolitan Museum Collection. Lovely as it is, it reminds me of a pantomime horse costume, with the actor playing the rear of the hose bent over and hugging the waist of the actor in front! It’s easy to understand how that dress, which is so “of its moment,” would not get many wearings before it fell out of favor; for one thing, it’s too memorable to appear repeatedly at the level of society that wears such expensive clothes. But this outfit which I wonder about is middle class; of good quality, but not so memorable that a woman would abandon it because all her friends had seen it. Incidentally, it is possible to get into it without the aid of a maid. A dress meant to be worn more than once. Of its many beautiful metal buttons, only one is missing, the one at the top of the throat. When being worn, this area would have been covered by a lace jabot, often secured by a large brooch, so it’s even possible that the owner removed that button on purpose to allow a frill on her blouse to fall through. 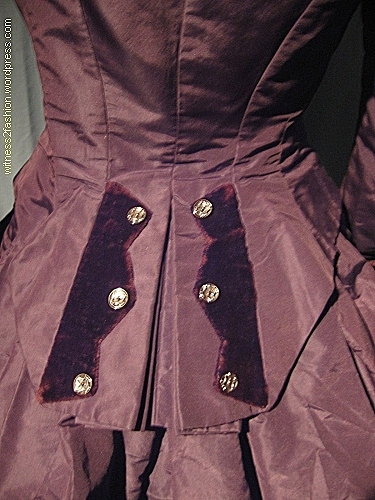 You can see a mark left by a brooch pin on the velvet collar, too. Collar and missing button. A mark left by a brooch pin is visible in the velvet collar, at right. The velvet is not worn; it just photographs a different color depending on the direction of the pile. Here is a slightly better view (sorry about the hasty photos) of the beautiful buttons, which have paste gems in their centers . . .
Buttons on center front of bodice. There is a glittering stone in the center of each. Back peplum and button trim. Even if the dress went out of fashion, why did no one harvest these 27 buttons for re-use? The back view, on a very lopsided mannequin. Overall, there is a slightly military flavor to the metal buttons, the back peplum detail, and the suggestion of a man’s lapels created by the velvet front trim. I can picture Ibsen’s character Hedda Gabler (spoiler alert if you click!) being attracted to such military details. 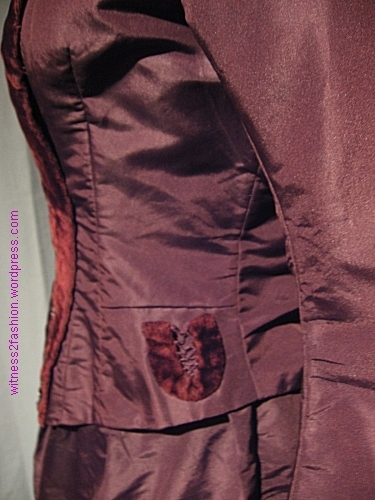 The wine-brown silk and burgundy velvet fabrics would have been ready for re-use, too. This dress was not petite; it had a center back-to-waist measurement of 16″, a 34″ bust, and a 26″ (made for a corseted) waist. 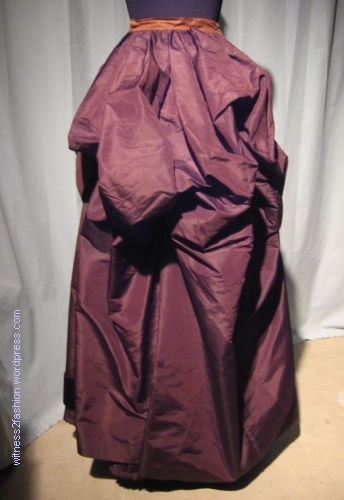 Skirt bustle, back view. Note the deliberate asymmetry. Side view. The bustle seems to be too low, and it hangs a little longer than the rest of the skirt hem. I think it needs a period cage bustle support under it. Look at the lovely workmanship on the seam finishes, etc. 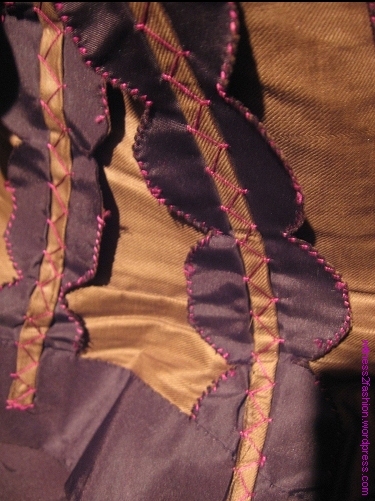 Inside the bodice. The edge binding in reddish stitches matching the burgundy velvet is a nice surprise. They secure tiny rolled hems. The boning channels are feather-stitched, which was usual. This looks like professional construction to me; I think a dressmaker, not the wearer, made this dress. The lining is brown cotton sateen. 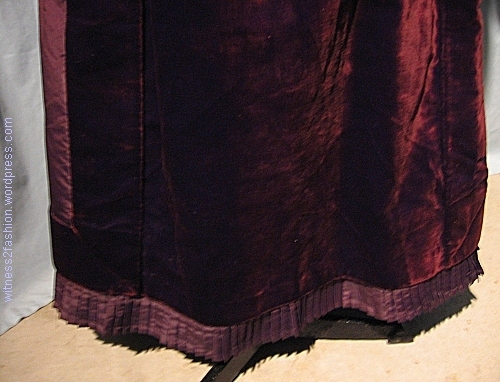 The front of the skirt has a panel of velvet emerging from under the draped “apron,” and a pleated ruffle inside the hem to protect it from wear. Which brings me back to the reason this outfit lingers in my mind. Why didn’t the woman who owned this dress go on wearing it until it began to look soiled or worn out? And why was it stored so perfectly for over a century, instead of being plundered for buttons, fabric and trims to make newer clothing in the 1890s? One happy possibility is that the owner became pregnant and couldn’t wear it for a while; perhaps, by the time her figure returned to normal, the fashion was outmoded. Perhaps there was a death in the immediate family, and, again, by the time she was out of mourning clothes a year later, the fashion for bustles had passed. But there is something about the careful preservation of this garment that makes me wonder if it was the wearer who died, so that her grieving family packed it and saved it, as my father once saved my mother’s clothes. Of course, Dickinson was not punning upon the word “Bustle” as she was upon “Morning, ” but that word may be a subconscious reason why this outfit made me think of this poem. P.S. I have written as if this outfit was from the 1880s; if you have more expertise and can date it to the 1870s, please comment. 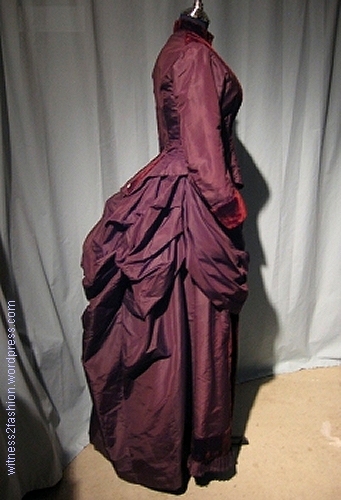 http://www.fashion-era.com/mid-late_victorian_fashion.htm#The Late Victorian Silhouette 1878 – 1901. And since I never like to rely solely on modern sources, I looked at Peterson’s Magazine from 1870, 1876, and 1882 and saw similarly styled dresses in all of them. You can see scanned copies of Peterson’s on Google books (keyword search “dress”, and then look at the “Fashions of January, Feb. etc to quickly find the right section; otherwise it will take forever to find since the volumes are usually 1,000 or so pages long!). The live links to pages don’t work very well, but what a great resource! I particularly loved the interior shots! Wow! Thank you for sharing such wonderful photos of the inside! I was thinking exactly the same things you were for reasons it looks so unworn. The only other thought I had was perhaps it was a dressmaker’s display that was worn briefly by a model, but a dressmaker would probably have used those buttons and fabric on something else eventually. Beautiful dress! I can only imagine how much more wonderful it was in person! That is a gorgeous dress – and I agree, the interior shots tell as much of a story as the exterior. Thank you for such an indepth article with photos! It makes reproducing such lovely works so much easier!! It’s a privilege to handle garments like this. I’ll try to show interior construction,too, when I can. Beautiful garment, thanks for posting it, and my bet is late 1870’s as it looks like a family photo I have. Also, it could well have been kept as the woman’s wedding dress, higher quality workmanship, and materials… especially a wedding in the colder part of the year. June brides are a modern convention. Thanks for the happy thought that it was a wedding dress — perhaps followed by a baby and then… it was out of style!